Borderlinx | Buy Neckermann and ship worldwide with Borderlinx. Cheap rates guaranteed. Once one of Europe's biggest mail order companies, Neckerman Germany has a strong brand history. With its acquisition by Otto in 2012, they have since re-emerged as a leading ecommerce retailer. Neckermann Germany now strives to partner with you for your living, electronic and technology needs. When shopping the Neckermann Germany online store, you can expect personalized customer service with an emphasis on reliability, safety and quality. From laptops, game systems and entertainment centers to bar cabinets, linens and sofas, Neckermann Germany has the full range of products you are looking for when outfitting your home and your life. With a virtually endless range of goods for every room in the house and innovative products that enhance your daily activities, provide entertainment and make life easier Neckermann Germany products are the perfect addition to any home. Product pricing is always reasonable and discounts are plentiful. Even better, with the Neckermann Germany installment payment plans, affordability is always within your reach. There are more than 150,000 products to choose from, ensuring you will easily find what you're seeking. Now, you can order Neckermann Germany products, from around the globe, with Borderlinx! Enjoy Borderlinx benefits with shipping to 64 countries. 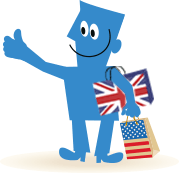 Get your own US and UK shipping addresses through Borderlinx and remove the guesswork on delivery costs with our shipping costs calculator. A number of services are available through Borderlinx to make international ordering from Neckermann Germany hassle-free, including shipment value protection, free repacking and consolidation services.